Azure Functions allow you to declaratively add bindings to external resources by decorating a C# function with binding attributes. This means you need to write less code and the code you do write will focus more on your business logic than on updating resources. In this article, I will show you how to add CosmosDB bindings to an Azure function in order to read from and write to a CosmosDB database. 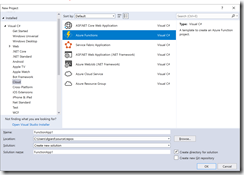 See this article to learn how to create a new CosmosDB instance. Next create a Database and Collection within your CosmosDB. This article describes how to create a CosmosDB Database and Collection; or you can quickly create a Database named "ToDoList" and a Collection named "Items" from the "Quick Start" tab of the CosmosDB database you created, as shown in Fig. 1. As you work with data in this database, you can view the documents on the "Data Explorer" tab, as shown in Fig. 2. You will need the Connection String of your CosmosDB. You can find two connection strings on the "Keys" tab, as shown in Fig. 3. Copy either one and save it for later. Create a function in Visual Studio 2017. If you base it on the "Azure Functions" template (Fig. 4), it will have many of the necessary references. Open the local.settings.json file and add a key for "CosmosDBConnection", as shown in Fig. 5. Set its value to the connection string you copied from the "Keys" blade above. 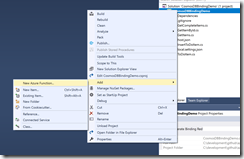 Delete the existing Function1.cs file from the project and add a new function by right-clicking the project in the Solution Explorer and selecting Add | New Function from the context menu, as shown in Fig. 6. Give the function a meaningful name. Repeat this for any function you wish to add. CosmosDB is a schemaless document database, meaning that the database engine does not enforce the type of data it accepts. This is distinct from something like SQL Server, which requires you to define in advance the name, data type, and rules of each column you expect to store. If you want to validate data, you must do so in your application. One way to do this is to create a Model class that matches the expected incoming data. Let's walk through the function. The first parameter is the incoming HTTP Request. It is decorated with HttpTrigger, indicating this is an HTTP trigger. Within this decorator's parameters, we indicate that the function can be called anonymously, that it can only be called with an HTTP POST (not GET or PUT or any other verb); and that we are not changing the default routing. The second parameter is an output parameter of type ToDoItem. We will populate this with the data in the Request body, so we type it as a ToDoItem. This parameter is decorated with the CosmosDB attribute, indicating that we will automatically insert this document into the CosmosDB. The databaseName, collectionName, and ConnectionStringSetting tell the function exactly where to store the document. The ConnectionStringSetting argument must match the name we added for the connection string in the local.settings.json file, as described above. The logger allows us to log information at points in the function, which can be helpful when troubleshooting and debugging. The 3 lines above retrieve the body in the HTTP POST request and convert it to a .NET object of type ToDoItem, which validates that it is the correct format. This line is not necessary, but may help us to understand what part of the function executed when we are troubleshooting. When the document is successfully inserted, we return an HTTP 201 (Created) status to indicate success. The following function retrieves all the documents in a container. The name of the function is “GetItems”. The Run method executes when the function is triggered. This method is asynchronous and will eventually return an ActionResult. The first parameter is the incoming HTTP Request. It is decorated with HttpTrigger, indicating this is an HTTP trigger. Within this decorator's parameters, we indicate that the function can be called anonymously, that it can only be called with an HTTP GET; and that we are not changing the default routing. We did not need to write code to query the database. This happens automatically. The code above simply verifies that items were returned and transforms them into List<ToDoItem> and stores this list in a local variable. We return a 200 (“OK”) HTTP response and the list of items. The following function retrieves a single document, given the ID. This parameter is what will be returned by the function (eventually, because it runs asynchronously). It will be an object of type ToDoItem. This parameter is decorated with the CosmosDB attribute, indicating that we will automatically retrieve the list from the CosmosDB. The databaseName, collectionName, and ConnectionStringSetting tell the function exactly where to store the document. The id tells the function on which Id to filter the results. Debugging information. Not necessary for the operation, but helpful when troubleshooting. We did not need to write code to query the database. This happens automatically. The code above simply checks if an item was returned matching the ID. If an item is found, we return a 200 (“OK”) HTTP response, along with the item. If no item is returned, we return a 404 (“Not Found) HTTP response. The following function retrieves a set of document. A query tells the function how to filter, sort and otherwise retrieve the documents. In this example, we only want to return documents for which isComplete = true. The name of the function is “GetCompleteItems”. This parameter is what will be returned by the function (eventually, because it runs asynchronously). It is a list of objects of type ToDoItem. When serialized, this will be transformed into an array of JSON objects. This parameter is decorated with the CosmosDB attribute, indicating that we will automatically retrieve the list from the CosmosDB. The databaseName, collectionName, and ConnectionStringSetting tell the function exactly where to store the document. The SQlQuery tells what query to run to retrieve the data (in this case, return only rows with isComplete=true) It is important to note that I am using the JSON property (“isComplete”), rather than the .NET class property (“IsComplete”) in this query. Even though they differ only in their case, the query is case-sensitive. Notice that in each of these functions, I did not need to write code to query or update the database. By decorating a parameter with the CosmosDb attribute, the function automatically took care of the database operations. You can find this code in the CosmosDBBinding solution in my Azure Function demos on GitHub.